Burnishing deck raises for simple operator friendly pad replacement. Engineered for exceptional performance, Minuteman’s Lumina™20 and Lumina 20TD Battery Burnishers utilize a 2.5 H.P. pad drive motor and Minuteman’s exclusive patented PAMS® (Passive Air Management System) Dust Control System. 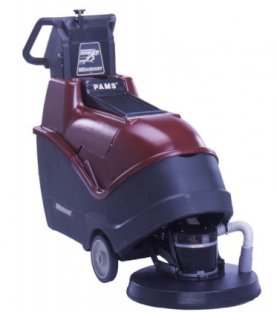 PAMS helps to reduce the need for dust mopping after burnishing by capturing finish compound and dust particles. The result — innovative battery burnishers that provide high productivity, solid performance and increased labor savings benefits. The Lumina 20 and Lumina 20TD feature a 20″ burnishing pad with pad driver speeds up to 2000 rpms to give a wet-look shine to floors. These low-profile, ergonomically designed machines feature Minuteman’s Multi-Flex® pad driver which adjusts to the highs and lows of the floor while retarding pad growth. The Lumina 20 and Lumina 20TD battery burnishers are ideal for environments that require a high productivity burnisher such as hospitals, hotels, schools, office buildings and retail stores.